If you are still looking for the best place to celebrate the Chinese New Year, Nanay's Trip has a perfect suggestion for you. There is no better place in the metro to welcome the Year of the Fire Monkey but in Manila Chinatown! Binondo is one of my favorite places in Manila. I could spend one whole day just walking in its busy streets without getting tired. Every visit in this place is a chance for me to explore its beauty and richness. I may have dined in the most famous food spots around Binondo but there is one more thing that I want to experience here. You guessed it right, I want to dine and even spend an overnight stay in a hotel located in the heart of this culturally rich spot in Manila. Chinatown Lai Lai Hotel offers a great list of festive activities to welcome the year of the Fire Monkey. 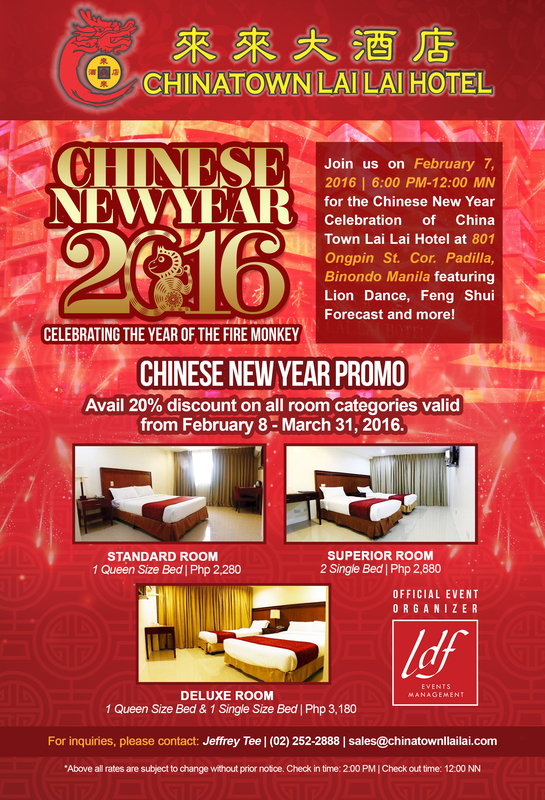 This hotel located in Ongpin Street promises to give its guests the best Chinese New Year celebration. A traditional Lion Dance will signal the start of the festivities followed by a Taoist Blessing to bring good luck to the whole Filipino-Chinese community. One of the most awaited part of the celebration is the sharing of Feng Shui forecasts and predictions for the new year. There are also bonus events which hotel guest will truly enjoy. 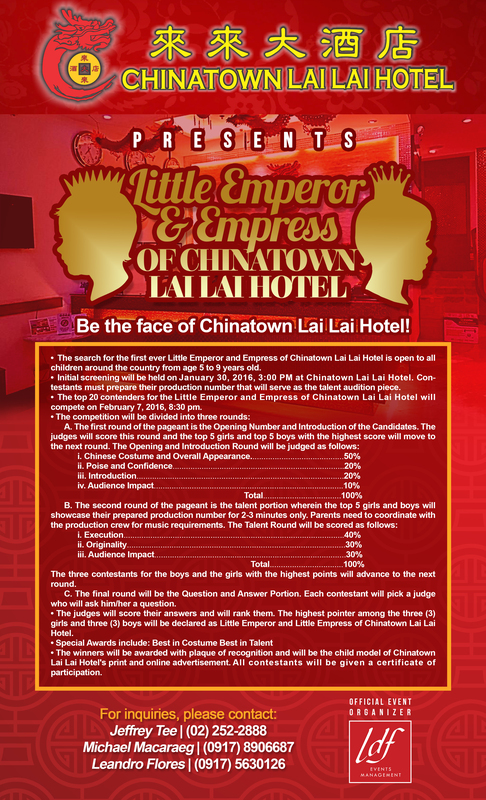 The hotel will choose the lucky child who will be the face of Chinatown Lai Lai Hotel in its print and online advertisements. Find out who will be the hotel's Little Emperor and Empress 2016. One of the celebration's highlight is the 1st Chinatown Lai Lai Hotel Singing Idol competition. 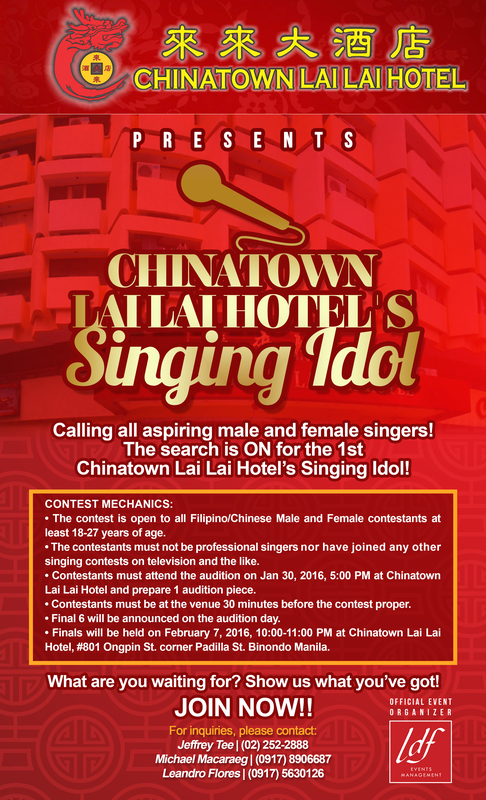 Young and talented Filipino / Chinese singers will compete to be the first grand winner and be the hotel's Singing Idol. Chinatown's Lai Lai Hotel wishes its guests a lot of good luck and offers great discounts this new year. Everyone can avail of the hotel's special package featuring 20% discount on all room categories from February 8 - March 1, 2016. Grab this chance for a unique family staycation in Chinatown with a discounted room rate starting at P1,824.00 for an overnight stay! This special package comes with a breakfast for two and complimentary high-speed WiFi. 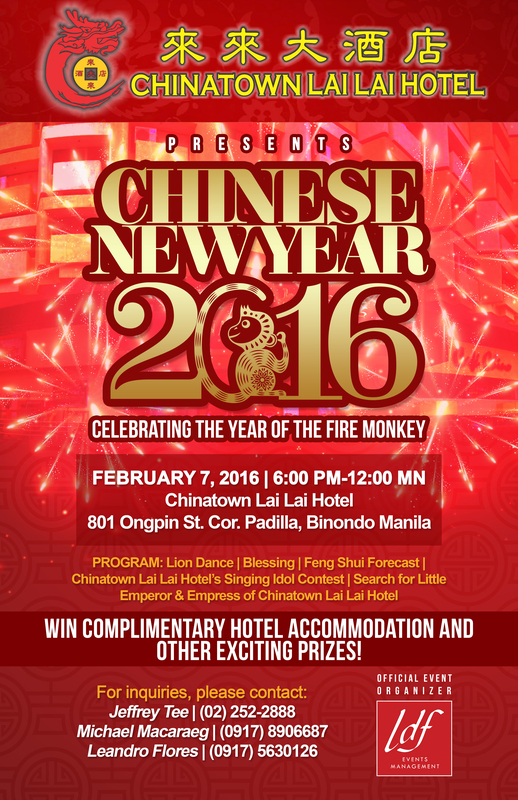 Come and join us in welcoming the Year of the Fire Monkey in Chinatown Lai Lai Hotel on February 7, Sunday, 6:00 p.m. - 12:00 midnight. Nanays, Gong Xi Fa Cai!